La Fiesta Video Slot Review - Casino Answers! La Fiesta is a 5-reel, 9/25-line video slot found at Cryptologic and Vegas Technology casinos, featuring a wild symbol, scatter wins, multipliers and a bonus game. 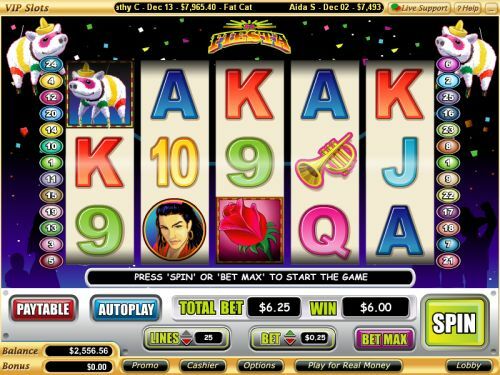 You can play the La Fiesta video slot at [Americans: Unfortunately due to legal restrictions you are unable to play at any of the online casinos this game is at. We recommend you trying playing the unique slots at Win A Day Casino instead.] and Bovada. On the Vegas Tech platform, you can bet $0.01, $0.05, $0.25, $0.50, $1, $5 and $10 per line. You will be able to select up to 25 paylines. You can bet anywhere from $0.01 up to the maximum total bet of $250 per spin on the La Fiesta penny slot game. On the Cryptologic platform, you can bet $0.10, $0.25, $1, $2 and $5 per line. You can bet as little as a dime per spin up to the maximum total bet of $45 per spin. To play the La Fiesta video slot on either platform, select your bet and press the “Spin” button or use the “Bet Max” button to play all paylines. 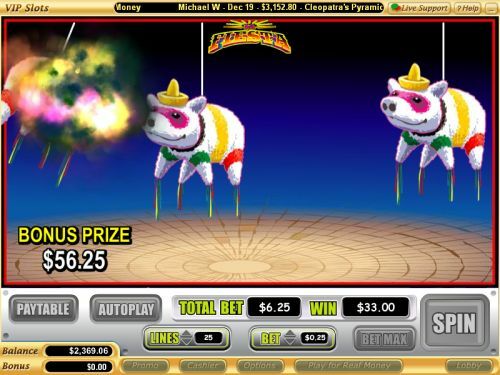 The highest paying symbol on the La Fiesta slot game is the Pinata symbol. If you land 5 Pinata symbols on an active payline, you will win the 10,000 coin top jackpot. The Pinata symbol is wild and will substitute for all other symbols on the La Fiesta video slot. Also, when substituting in a winning combination, the Pinata wild symbol will act as a 2X multiplier to double your winnings. The second hgihest paying symbol is the Woman symbol, which can pay out up to 2500 coins (or 5000 coins when doubled). The scatter symbol is the Rose. At Vegas Tech online casinos, 2, 3, 4 or 5 Scattered Roses will pay out 1X, 5X, 25X or 250X your total bet. The scatter symbol pays left to right and right to left only at Vegas Tech casinos. At Cryptologic casinos, 3, 4 or 5 Scattered Rose symbols will pay out 5X, 25X or 500X your total bet. At Cryptologic casinos, when you hit 3 Scattered Rose symbols in a row, you will trigger the La Fiesta bonus game. You will be awarded between 1 and 3 rounds to play. You will be taken to a 3X3 grid. You will click on the various panels on the grid to reveal symbols. Once you have matched 3 of a kind, you will win the prize associated with that symbol. You can play this bonus game by signing up at a Cryptologic casino like [Americans: Unfortunately due to legal restrictions you are unable to play at any of the online casinos this game is at. We recommend you trying playing the unique slots at Win A Day Casino instead.]! On the Vegas Tech platform, if you land 3 Pinata symbols anywhere on the reels, you will trigger the La Fiesta bonus game. You will win up to 3 rounds to break up to four Pinatas to win prizes. You can win prizes of up to 250X your total bet. A round will end when an empty Pinata is struck or all four have been broken. Bonus game wins are added to payline and scatter wins. You can win big from this bonus game when you play at Bovada! Payouts are made according to the Paytable. Payline wins are multiplied by the bet per line. Scatter wins are multiplied by the total bet. Scatter wins are added to payline wins. Highest win only on each selected payline. Coinciding wins on different paylines are added. All symbols pay left to right, except for the Scattered Rose (which pays left to right and/or right to left on Vegas Tech and any on Cryptologic). The Pinata symbol will substitute for all symbols except for the Scattered Rose. The prize is doubled if one or more Pinata symbols substitute in a winning combination. On the Vegas Tech platform, hit “Autoplay” to open up the La Fiesta autoplay mode where you can select the number of spins (5, 10, 25, 50, 100, 250 or 500) and number of seconds between spins (0.25, 0.50, 1, 1.50 and 2). Stop settings include stop once all spins are complete, stop when jackpot is won, stop if a win exceeds or equals ($50, $100, $150, $200 or $250), stop on any win and stop if credits increase/decrease by ($50, $100, $150, $200 or $250). You can cancel autoplay on the La Fiesta online slot at any time. The Cryptologic version of the La Fiesta video slot has a basic autoplay mode. You can use the “+” and “-” buttons to select from 1 to 99 autoplay spins. To start the La Fiesta autoplay mode, press the “Spin” or “Bet Max” buttons. You can stop the autoplay mode at any time by pressing the “Stop” button. Each version of the La Fiesta video slot is actually quite different. The Wagerlogic version is 9 lines and offers a higher scatter payout. The Vegas Tech edition has 25 lines and has scatter wins for two symbols. Also, the video slots are designed differently and the high card symbols look different. Of course, we can’t forget to mention the fact that they have two different bonus games that are triggered completely differently! There are also other differences which have been highlighted in this video slot review. To play the Cryptologic version of La Fiesta, please visit [Americans: Unfortunately due to legal restrictions you are unable to play at any of the online casinos this game is at. We recommend you trying playing the unique slots at Win A Day Casino instead.]. For the Vegas Tech version of La Fiesta, you can sign up and make a deposit today at Bovada. Where can American players play the La Fiesta online slot game for real money? Players who are based in the United States of America can play a USA-friendly version of the La Fiesta slot machine at Vegas Tech casinos like Bovada. Where can I play a free flash game of the La Fiesta video slot? You can play a free flash game of La Fiesta at Vegas Tech online casinos including Bovada. You can play for free or you can play for real money. If you experience any issues with the flash casino, we recommend that you download and install the latest version of Adobe Flash Player. What are the differences between the Wagerlogic and Vegas Tech versions of La Fiesta? The differences between the two include (but are not limited to): the design, the look of the symbols, scatter payouts, scatter directions, betting options and the bonus game. We recommend that if possible, you play both versions of La Fiesta to decide which of the two versions you prefer.